It is difficult indeed to overstate the importance of victory day in Russia. In its solemnity, it is as close to a religious festival as any secular event could be. The Soviet Union was adept at filling the void left by its Marxist atheism with ritual and symbolism, and, more than on other days of the contemporary calendar, its imprint was still palpable on May 9th, 2015. 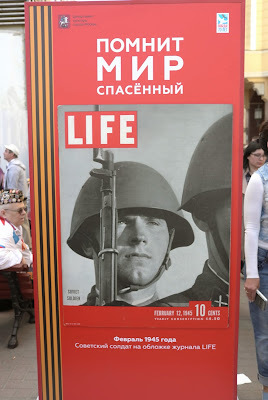 Posters of war heroes – military genius Georgy Zhukov’s foremost amongst them - could be seen everywhere in central Moscow; Soviet-era hammer-and-sickle flags were flying off almost every building. Many a Muscovite sported the Red Army’s distinctive cap, with some dressing their children in full World War Two garb. As in Soviet times, a dwindling contingent of elderly veterans, often in full uniform and always with an inconceivable array of medals proudly pinned to their chests, walked the streets, to be offered red carnations in thanks to their sacrifice. All in all, this wasn’t surprising: Russians participated in the ‘Great Patriotic War’ as the main ethnic group within the USSR, and Stalin made sure to appeal to their national sentiments by skilfully combining Soviet and Tsarist imperial identities. After Hitler’s surprise attack in 1941, positive allusions to the pre-Soviet past suddenly became part of official propaganda, including references to Tsar Alexander I and Marshall Kutuzov, the victorious leaders of a previous ‘Patriotic War’, in 1812; perhaps more than during any other period under Communist rule, Russian-imperial and Soviet identities became intermingled and entwined. Stalin may have remained largely absent from the contemporary event’s official iconography (his picture was rarely displayed on official posters), but his basic idea – of harking back to Russia’s past military glory – has returned, with a vengeance. While most of the outside world has focused on Russia’s largest post-Soviet military parade in recent days, a tiny, orange-black ribbon was, in fact, a much more important indicator of contemporary Russia’s claim to its place in history, and the world. Its colours refer to the ‘Order of St. George’, a military honour instituted by Catherine the Great herself in 1769, during her conquest of the Crimea, and to the ‘Order of Glory’, introduced by Stalin during the Great Patriotic war, in 1943. Re-instated under its original, Tsarist name in post-Soviet Russia, its colours were adopted by pro-Putin groups following Ukraine’s Orange revolution, and actively pushed as a symbol of national pride following last year’s (re-)annexation of the peninsula. It has now become an established element in Russia’s Victory Day commemorations: it could be seen everywhere in the landscape, on posters, in toy shops, banks, the metro, on handbags and clothing, and in more inappropriate locations. The ribbon had never featured prominently in Soviet-era Victory Day celebrations; and its present-day ubiquity clearly speaks to the ability of states and societies to invent tradition as required by circumstance. In effect, the ‘Georgievsky’ ribbon provides Russians with something they have had in short supply in recent decades: a sense of continuity in a history riven by rupture. Today, the fundamental challenge posed by the 1917 revolutions and the fall of the Soviet Union to creating a seamless historical narrative that appealed to Russians’ sense of self has been resolved in much the same way as in 1941-45: through an appeal to previous incarnations of the Russian state, and, more specifically, to the military successes of yore. It is not by accident that both 1812 and 1945 are memorialised in one and the same Moscow park, at the foot of the Kremlin. This small ribbon is about more than just World War Two: it combines the previous experiences of Russian martial glory – loudly proclaimed by a giant display on New Arbat Avenue - into one continuous narrative, running from the Tsars, over the commissars, to the siloviki. Today’s Russian state simply could not formulate this sense of continuity in institutional or ideological terms, as is done elsewhere. Save for Christian Orthodoxy, the empire of the Tsars is long gone; and, except of course for its victory over Fascism, the Soviet Union was a socio-economic failure. The Russian Federation itself does not offer a political or economic alternative with much universal appeal, a fact of which Russians themselves are painfully aware. What it does have, however, is sheer power, and a history of power; and this is what provides its leadership with the element of continuity that was so lacking in recent decades. Russia’s elite has to stick to a narrative of ‘Derzhavnost’, or great-power-ness: the St. George’s ribbon links its rule, and its wars in Crimea/Ukraine, to the victories of 1945 and 1812. A long-held sense of grievance has now culminated in a return to the certainties of a largely autocratic past; but while these certainties might appeal to the Russians themselves, this return to a narrative of imperial glory also contains the seeds of its own unmaking abroad. The little orange-and-black ribbon may work wonders at home; in the former Soviet Union, however, it remains a highly contentious – at times even inflammatory - piece of fabric, acting as a marker of narrow pro-Russian sentiment rather than a unifying force, and this on a day when the nations of the former Soviet Union – all of whom contributed and suffered in World War Two – should be able to remember their dead in a common cause. Instead, what we witness today is a fracturing of memory, throughout the former USSR. The Baltics have always held a radically divergent view of the period between 1939 and 1945 in any case. But, for the first time in its history, Ukraine’s central government has now decided to hold the Victory Day celebrations on the 8th instead of the 9th of May, together with its Western allies; and while St. George’s ribbons have been on prominent display in the region’s pro-Russian entities - from South Ossetia to the Donetsk Republic - even nominal allies of Putin’s - like Belarus and Ukraine - have made sure to have a nationally specific alternative at hand. From that perspective, the St. George’s ribbon could also be seen as an unwitting, implicit admission of failure on the part of Russia’s elite, an indication of its inability to reinvent post-Soviet Russia beyond the narratives of past grandeur, and great power status, in ways that could hold genuine soft-power appeal to those within its cultural sphere of influence: and such a deficit in this most elusive form of power often lies hidden behind ostentatious displays of its harder variants.